Publication Design Throughout his entire career David Smith was replenished by drawing and painting from the female figure which inaugurated many of his ideas and charged his sculpture with their emotional impact. David Smith: To and From the Figure was a seminal exhibition of the artist's work presented by Knoedler Gallery with an accompanying book published and distributed by Rizzoli International. 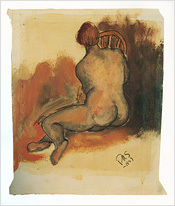 The exhibition focused on Smith's explorations of female form in his sculpture and related drawings and paintings. We designed and produced the visually poetic hardbound-book cataloging the exhibition in collaboration with Candida Smith of the David Smith Estate, emphasizing the startling juxtapositions and relationships among the variety of his mediums. "When I begin a sculpture I'm not always sure how it is going to end. In a way it has a relationship to the work before, it is in continuity with the previous work-it often holds a promise or a gesture toward the one to follow." Smith's work is considered some of the most important works of 20th century American sculpture.